We can access the Filters by placing the cursor in a Record and clicking the right button on the mouse. There, you will find the menu for Filters by placing the cursor over "Filters". Filters can also be used to order our Records in a Table. 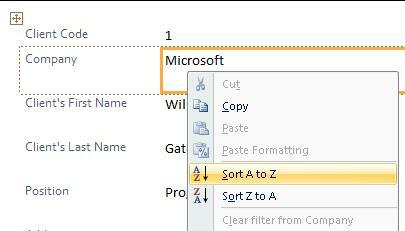 The options "Sort A to Z" or "Sort Z to A" will be applied to the field where we placed the cursor on. It organizes all the Records of the Table according to the criteria. 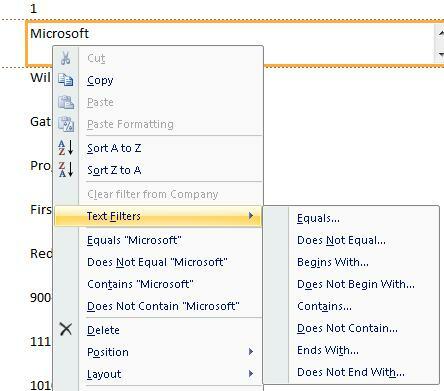 On the other hand, the option 'Contains "Microsoft"', after placing the cursor over the field we want to use as base to filter the Table, will filter, for example, Microsoft. This will only show the Records whose "Company" field is the word Microsoft. Finally, but not least important, is the option of "Clear filter from...". You'll notice that a check appears next to the option "Equals "Microsoft"". This indicates a filter has been used. 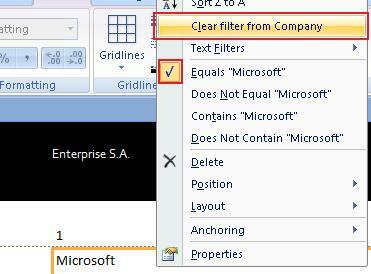 If we select the option "Clear filter from Company", we will remove the filter we placed on "Microsoft".